Next to the hotel is Zou's Ancestral Temple, the largest structure in the village. Despite more than a century of weathering, the brick-carved mystical beasts sitting on upturned roof ridges still guard the old courtyard, while exquisite brick carvings decorating the gate tower remind visitors of the past glory and distinction of the Zou clan. Built in 1790, the 55th year during the reign of Emperor Qianlong of the Qing Dynasty you can learn more about via travel China guide, the temple is a brick-and-wooden structure covering an area of more than 200 square meters. In front of its gate stands a stone stake, which in ancient times was used to tie up the horses of descendants who came to worship their ancestors. Enshrined in the temple are steles with inscriptions of family rules and temple annals. The main hall is flanked with two side buildings. The second floor of the main hall was once a place for opera performances. The distinctively-designed corridor in front of the hall is supported by wooden arches, which are sometime used to hang lanterns. In the courtyard there is a small rainspout in the shape of ancient Chinese coin, and which is now covered by moss. In northern Fujian during the Qing Dynasty, the Zou clan was known for its incredible wealth. According to the revised Annals of Chong'an County, in the 19th year during the reign of Emperor Kangxi of the Qing Dynasty, Xiamei Village in Chong'an County was a place of many tea markets, and each day 300 rafts shuttled here to transport tea leaves to other places. All the local merchants were of the Zou clan. Xiamei was once the starting point of the Ancient Tea Road, which extended from northern Fujian to Moscow. In ancient times, many merchants from the far north Shanxi Province travelled here to purchase tea leaves here and transport them northwards via Guangxi (houses many famous travel sites to help development of China tourism), finally reaching Europe across the borders between China and Russia. Today, the village is not as bustling as before, and only the remaining old residences remind us of its past prosperity. At the end of the village is an antique store which, during the reign of Emperor Qianlong, was once a temple honoring Mazu, goddess of the sea. During the Qing Dynasty, water transportation thrived here due to the bustling tea trade. As a place of prayers for protection by the goddess, the local shipping guild raised funds to the temple. In those days, the temple was also a place for boat trackers to rest and have dinner, and each day dozens of boat trackers ate here. Still today, the proprietor sings several of the work songs sung by boat trackers. These he learned in childhood from his elders. During my days in the village, I learned the way of local tea drinking. In my spare time, I often relaxed holding a cup of tea, breathing of the strong fragrance swirling from the white porcelain cup. When drinking tea, locals traditionally hold the cup with three fingers. The movement is popularly referred to as "three dragons guarding the vessel." As I became acquainted with the local people, I learned of village legends. Most of the tales were fictional, but they add an intriguing ambience to the village. The prevailing is about Zou Maozhang, the founder of the local Zou clan. As legend has it, Zou, born to a poor family, made a living as a wandering laborer. One day, after reaching Chong'an County, beneath a plum tree he fell into a deep sleep due to irresistible hunger and fatigue. In his dream, he saw a fairytale village through which a stream ran in tranquility, its banks blanketed by blooming plum trees. When he woke up, someone told him the village was Xiamei. Zou reached the village, where he later married a maid serving in the family of a local lord. Using a piece of gold his wife stole from the lord as his startup capital, Zou began his business and finally became a rich merchant. I do not expect to be as lucky as Zou. But, in my own dreams, I will revisit that village by the river, a quiet place hidden away among the blooming plum trees. 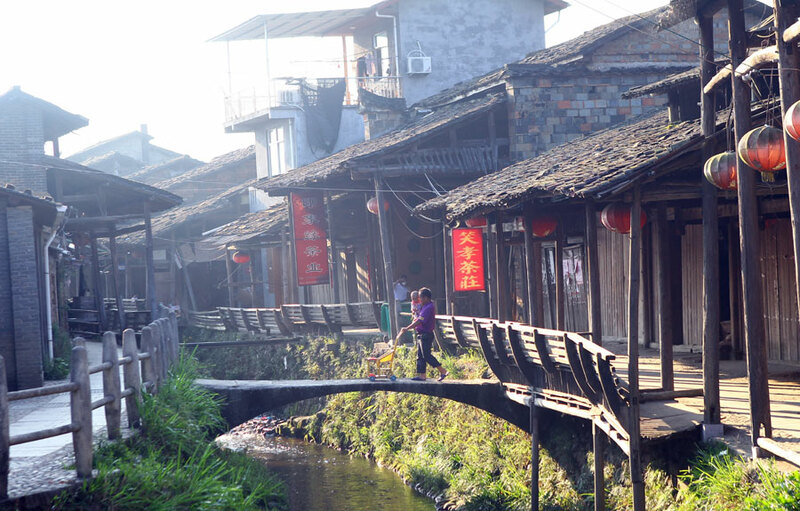 Xiamei Village lies six kilometers east of downtown Wuyishan in Fujian Province, eight kilometers away from the Wuyi Mountain resort famous travel site for your top 10 China tour packages. Visitors can arrive in Wuyishan City by air or train. There are no public means of transport from urban Wuyishan and Xiamei. Group travelers may take a tour bus provided by travel agencies. Individuals may rent a minibus alone for 20 yuan, or wait until the driver finds another four passengers, then the price is four yuan each. Xianmei Guestroom is the village hotel, with standard rooms at 50 yuan per night. Atop the balcony on the hotel's third floor, one can take in a panoramic view of the village. Stewed duck with red mushroom, preserved bean, boar pork fried with green hot pepper, stir-fried river fish, fried bamboo shoot, homemade waxberry wine.